Located on the southeast coast of the smallest continent in the world, Sydney serves as the state capital of New South Wales. Home to the Sydney Opera House, a UNESCO World Heritage Site, the city is considered one of the most popular tourist destinations in Australia. 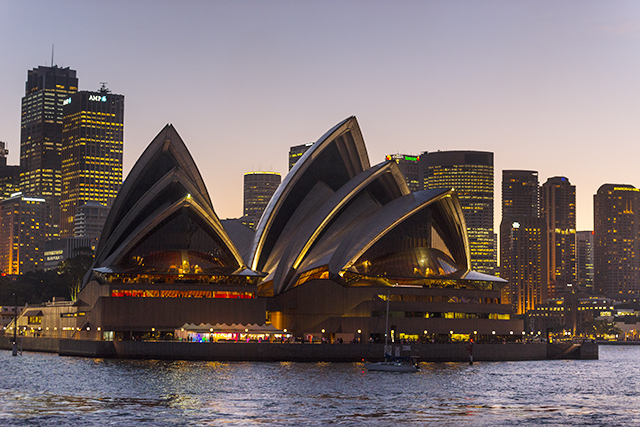 From the natural splendor of serene beaches and wild bushlands to exquisite architectural beauty, Sydney has it all. Here are our favorite things to do in this vibrant city. Previously, dining in Sydney meant heavy, traditional English and French cuisine. Now, Sydney’s talented chefs blend foods from the surrounding Asian, Pacific and tropical regions with more traditional European fare to produce lighter fare that’s packed with flavor. For a spectacular (albeit pricey) dining experience, try The Summit at the top of Australia Square. There’s also a row of fine Sydney restaurants along East Circular Quay on the way to the Sydney Opera House. On a continent surrounded by water, if you like seafood at all, make it a must-do while in Sydney! Proudly overlooking Sydney Cove with an unobstructed view of the Sydney Opera House, The Museum of Contemporary Art houses Australia’s most important collection of contemporary art from both national and international artists. The museum’s large open spaces allow for quiet contemplation of the constantly changing artistic works. Open daily (except Christmas Day) from 10am to 5pm; admission to the Museum of Contemporary Art is free. There’s no shortage of places in Sydney in which to buy Australian souvenirs, clothing, music and more. A popular shopping area at Harbourside in Darling Harbor offers not only a great shopping experience, but entertainment, food and fun for the whole family. Pitt Street in the city center has a great collection of stores and shopping arcades, including the famous Strand. Sydney also hosts a number of terrific markets on the weekend, the largest being Paddy’s Market in Market City, whose plentiful stalls are open from Thursday to Sunday and are well worth a look. A trip to Sydney would not be complete without a visit to one of the most recognizable feats of architecture in the modern world— the Sydney Opera House. Just as the pyramids are synonymous with Egypt, the Sydney Opera House is a focal point of Australia’s culture, welcoming approximately 4.5 million people each year. It took seven years to build the model of the Opera House and another 17 years to complete the actual building, which contains 1,000 rooms and over 1 million roof tiles. Since its completion in 1973, the Opera House has become one of the busiest centers of performing art in the world, conducting close to 3,000 events each year. Have you ever been to Sydney? What was your favorite part? Share your story in the comments!